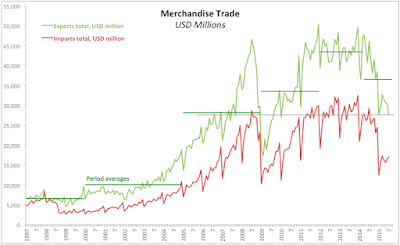 Central Bank of Russia released latest figures (for July 2015) covering external trade in goods. Here are some details. Russian exports of goods (in US dollar terms) fell 40.15% y/y in July following a 25.6% drop in June. These are not seasonally-adjusted figures, so we can only do y/y comparatives. The drop was sharper for Russian trade with countries outside the CIS (down 42.35% in July) than with CIS countries (down 'only' 22.71%). This implies a reversal in June changes when exports to CIS countries fell more substantially than exports to non-CIS countries (-30.46% and -24.76% respectively). Taking out some monthly volatility, 3mo average for Russian exports of goods were down 32.15% y/y in May-July, with distribution of declines pretty much even across both CIS and non-CIS states (-32.19% and -32.15%, respectively). Russian imports of goods fell even more than exports in percentage terms. Russian imports of goods fell 41.87% in July in y/y terms, having previously posted a decline of 38.3% in June. 3mo average through July 2015 was down 40.19% y/y. 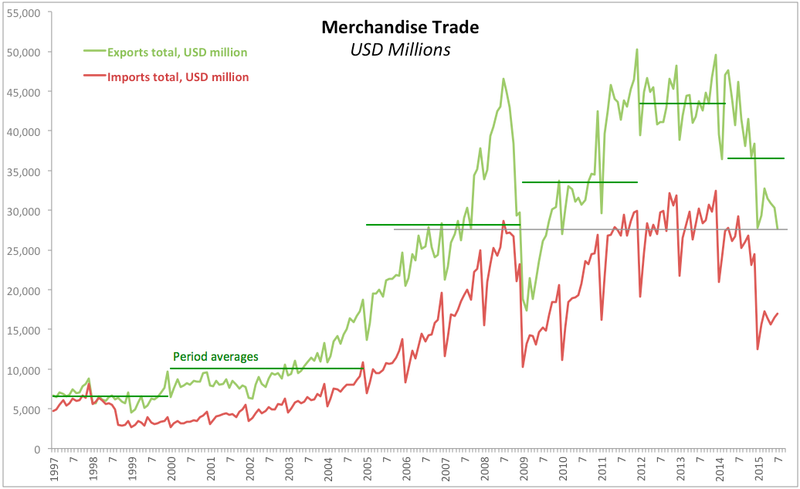 However, in level terms, declines in exports were sharper than declines in imports: 3mo average through July 2015 for exports was down USD14.04 billion against decline in imports of USD10.99 billion. As the result, Russian trade balance (goods only) deteriorated sharply in July 2015, declining 37.21% y/y in July, having previously posted a relatively small decline of 1.24% in June. 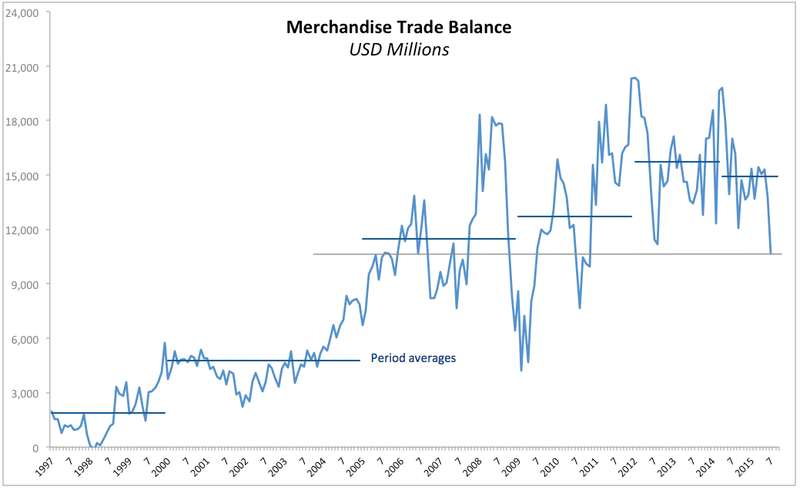 On a 3mo average basis through July 2015, trade balance in goods was down USD3.041 billion compared to the same period in 2014 (-18.66%). 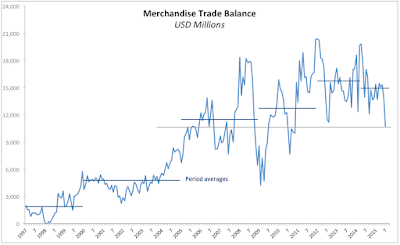 On 3mo average basis, trade balance with CIS was down marginally USD802 million in value terms, but sharply in percentage terms (-29.3%), while trade balance with non-CIS states was down sharply in both levels (USD2.24 billion) and in percentage terms (-16.5%). 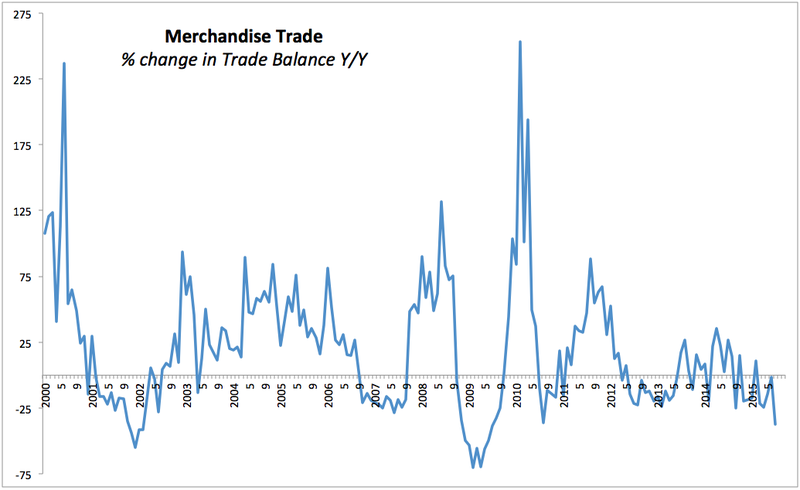 July 2015 y/y decline in overall Trade Balance for goods ranks as the sharpest since July 2009 and 13th sharpest decline since January 2000. CONCLUSIONS: Overall July drop in Russian Trade Balance (goods only) was driven primarily by lower energy (oil and gas) prices and deterioration in Ruble valuations (Ruble is down some 15% since July 1). As a related note, as reported by Bloomberg earlier this month, despite another strong harvest, Russian exporters of wheat are being held out of the global markets by the Government measures aimed at curbing food inflation at home.